KNAC.COM - News - Celebrating The 40th Anniversary Of MOTORHEAD! Celebrating The 40th Anniversary Of MOTORHEAD! Celebrating their 40th anniversary as rock n’ roll’s undisputed rebels, musical legends MOTÖRHEAD will appear on this weekend’s edition of VH1 Classic’s That Metal Show! The show airs this Saturday, March 7th at 9pm/8pm Central, and features Lemmy, Phil and Mikkey of MOTÖRHEAD as the honored Metal Modem guests via remote video. Make sure to tune in, and for more information on the show, please visit www.vh1.com/shows/that_metal_show. 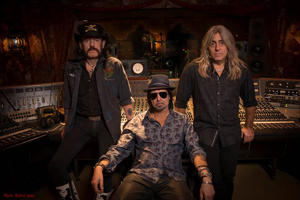 MOTÖRHEAD are currently in the recording studio with longtime producer Cameron Webb working on their upcoming album, which is due out Fall 2015. The revered trio will support the FOO FIGHTERS on tour this July in Japan and Korea (including a stop at the longest-standing music fest in Japan, the Fuji Rock Festival on July 24th, and the Ansan Valley Rock Festival in South Korea on July 26th) in addition to planning a U.S. tour in late summer 2015. Additionally, the band will set sail on the MOTÖRHEAD Motörboat cruise in late September. Last year, an international, multi-generational audience from over 30 countries came together to celebrate the legacy of the cruise's iconic namesake and escape into five days of true rock’n’roll living with no-holds barred! Last year’s Motörboat cruise included performances from MOTÖRHEAD themselves, plus more than 30 performances by 15 artists, including ANTHRAX, TESTAMENT, DOWN, ZAKK WYLDE and HIGH ON FIRE across four stages throughout the ship, as well as meet and greets with all of the artists, a book signing with MEGADETH's David Ellefson, a spoken word performance by ANTHRAX’s Scott Ian, an artist Q&A hosted by Jim Breuer, and some special rockin’ from the METAL ALLEGIANCE featuring a slew of musicians from the bands performing. If last year’s cruise, concerts, and tours are any indication (including their highly-regarded Coachella 2014 performance, which garnered press honors such as Rolling Stone’s “50 Best Things @ Coachella” and OC Weekly’s “The Best of Coachella”), MOTÖRHEAD has no intention of slowing down! Far beyond being a stellar addition to the band’s legendary catalog, MOTÖRHEAD’s most recent release, Aftershock, is widely regarded as one of the best musical releases of the last few years. Aftershock marked MOTÖRHEAD’s biggest selling first week and highest US chart debut numbers to date. In addition, Aftershock single “Heartbreaker” was nominated for a Grammy Award in the Best Hard Rock/Metal Performance category, marking the band’s fourth Grammy nomination. In 2005, MOTÖRHEAD won the Grammy for Best Metal Performance for their track “Whiplash”.